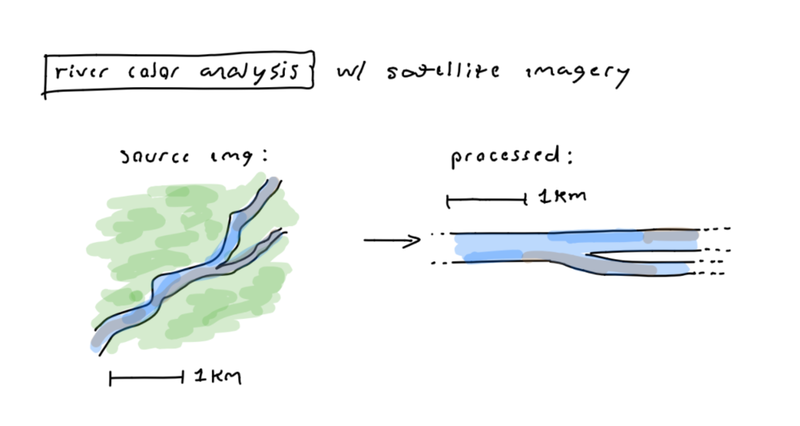 A system capable of detecting pollutants, sediment flow, and overall health of river systems by analyzing publicly available satellite imagery. Below are a few examples how the visual data will be used for detecting pollution, algae blooms, and sediment content. Build a computer vision system capable of tracing the path of a river as it winds downstream, and take cross-sectional image data for analysis. On the question of the width of the cross section, it'd be cool to have maximum granularity to the pixel level, because data can always be grouped upward, but cannot be easily derived downward in granularity. Visual analysis of colors could be done manually, with a human-powered tool for annotating color changes. This could also be automated by using the color data (primarily the "hue" vector of HSL colorspace) to detect inflection points and sharp changes in values. Feel free to hit up the comment section below with links to your projects or other projects that might help us build this!